Oscar Jackson Hinshaw1,6,7 [Jack O. Hinshaw2,8]. He married Lela Frances Tubbs1, Aug 29 19051 [Aug 29 19045]. Lela was born May 13 18891 [May 13 189010, about 18912,7], Big Sandy, Tennessee1. Hinshaw, Oscar J., head-of-household, age 27, born in Missouri; father born in Kentucky; mother born in Tennessee; first marriage, married 5 years; occupation: laborer, farm. Hinshaw, Lela, wife, age 19, born in Tennessee; parents born in Tennessee; first marriage, married 5 years; 2 children, 1 living. Hinshaw, Alice M., daughter, age 9 months, born in Missouri; parents born in Missouri [sic]. 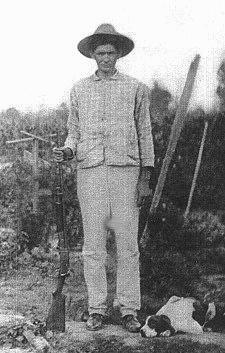 Mathews, Major, servant, age 10, born in Tennessee; black; occupation: laborer, farm. Hinshaw, Jack O., head-of-household, age 38, born in Missouri; parents born in Tennessee; rented home; farmer. Hinshaw, Lela F., wife, age 28, born in Tennessee; parents born in Tennessee. 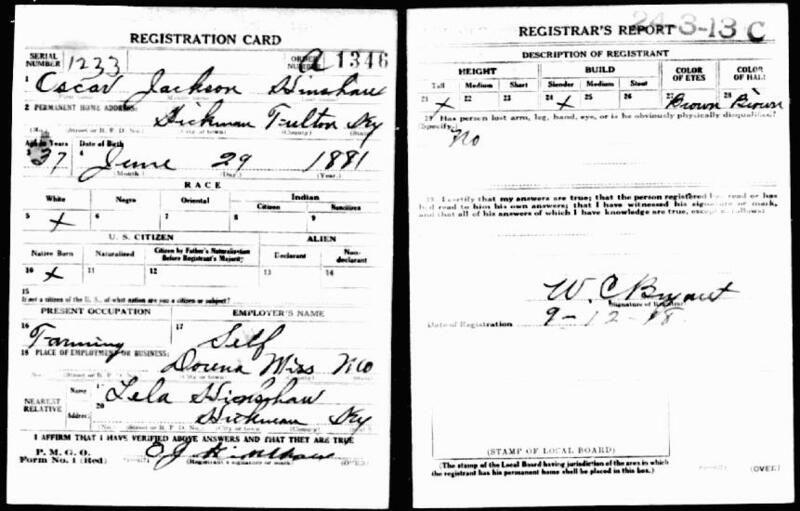 Hinshaw, Alice M. [or W. - unclear], daughter, age 9, born in Missouri; father born in Missouri; mother born in Tennessee; attended school. Hinshaw, Mary L., daughter, age 6, born in Missouri; father born in Missouri; mother born in Tennesse; attended school. Hinshaw, Douglas, son, age 4 years 1 month, born in Missouri; father born in Missouri; mother born in Tennesse. Hinshaw, Martha F., daughter, age 2 years 10 months, born in Missouri; father born in Missouri; mother born in Tennesse. Henshaw, Jack, head-of-household, age 48 [unclear], born in Missouri; parents born in Tennessee; first married at age 28; rented home; no radio in home; occupation: farmer, general farm; not a veteran. Henshaw, Lela, wife, age 39 [unclear], born in Tennessee; parents born in Tennessee; first married at age 16. Henshaw, Mary, daughter, age 17, born in Missouri; father born in Missouri; mother born in Tennesse. Henshaw, Douglas, son, age 15, born in Missouri; father born in Missouri; mother born in Tennesse; attended school. Henshaw, Martha, daughter, age 13, born in Missouri; father born in Missouri; mother born in Tennesse; attended school. Henshaw, Nancy, daughter, age 8, born in Missouri; father born in Missouri; mother born in Tennesse; attended school. Henshaw, Frances, daughter, age 4 years 9 months, born in Missouri; father born in Missouri; mother born in Tennesse. 1920 census, James Bayou Township, Mississippi County, Missouri; roll T625-932, ED 106, page 4A, line #10, dwelling #66, family #67. 1930 census, James Bayou Township, Mississippi County, Missouri; roll T626-1212, ED 1, page 4B, line #94, dwelling #84, family #87. 1900 census, James Bayou Township, Mississippi County, Missouri; ED 64, page 172A, line #30, dwelling #43, family #43. 1910 census, James Bayou Township, Mississippi County, Missouri; ED 95, page 3A, line #36, dwelling #43, family #43. 1920 census, James Bayou Township, Mississippi County, Missouri; roll T625-932, ED 106, page 4A, line #2, dwelling #63, family #64. Photo courtesy of Andrew Jackson Hinshaw.